“We are all accumulating a known neurotoxin in our brain from our conception to our death. The presence of aluminium in the human brain should be a red flag alerting us all to the potential dangers of the aluminium age. People with aluminum toxicity display many of the same symptoms as those with dementia, Parkinson’s, ADHD, autism, and other neurological diseases, and mounting evidence suggests aluminum may play a significant role in the development of those (and other) diseases. By taking steps to protect yourself, you can minimize your exposure while maximizing your body’s ability to rid itself of this toxic metal, which will move you toward a long and healthy life well into your senior years. Other toxins to beware of include fluoride and glyphosate. All of these are toxic in their own right, but research suggests they may be even more hazardous in combination. According to CDC, the average adult in the US consumes about seven to nine mg of aluminum per day in food, and a lesser amount from air and water. Approximately one percent of the aluminum you ingest orally gets absorbed into your body—the rest is moved out by your digestive tract, providing it’s functioning well. The remaining aluminum can be deposited not only in brain tissue, but also in your nerves, bone, liver, heart, spleen, and muscle. While one percent may sound like a tiny amount, your overall toxic load will depend on the total amount of toxins you’re exposed to over time. Your diet and digestive health will also play a role in how much your body is actually able to eliminate. One recently published case study found high levels of aluminum in the brain of a man who was exposed to aluminum at work for eight years. He later died from Alzheimer’s disease. According to the authors, it’s the first case showing a direct link between Alzheimer’s disease and elevated brain aluminum following occupational exposure. “In recent years, interest in the potential role of metals in the pathogenesis of Alzheimer’s disease (AD) has grown considerably. In particular, aluminum (Al) neurotoxicity was suggested after its discovery in the senile plaques and neurofibrillary tangles that represent the principal neuropathological hallmarks of AD. Indeed, dozens of studies have shown that fluoride causes brain damage and lowers IQ. Fluoride emitted by aluminum plants has also been implicated in animal disease. Farmers in Iceland, for example, claim their animals are being sickened by environmental fluoride contamination—some to the point of having to be euthanized. Others report higher rates of tooth damage and infertility among their livestock. Another related study linked occupational exposure to aluminum to the development of pulmonary fibrosis, a condition in which scarring on your lungs make it difficult to breathe. In this case, the exposure occurred during sanding of Corian material. All in all, it seems reasonable to conclude that the combination of aluminum, fluoride, and/or a number of other toxins can promote Alzheimer’s disease in addition to a number of other health problems. Pesticides, for example, have also been shown to have an adverse effect on neurological function and brain health. 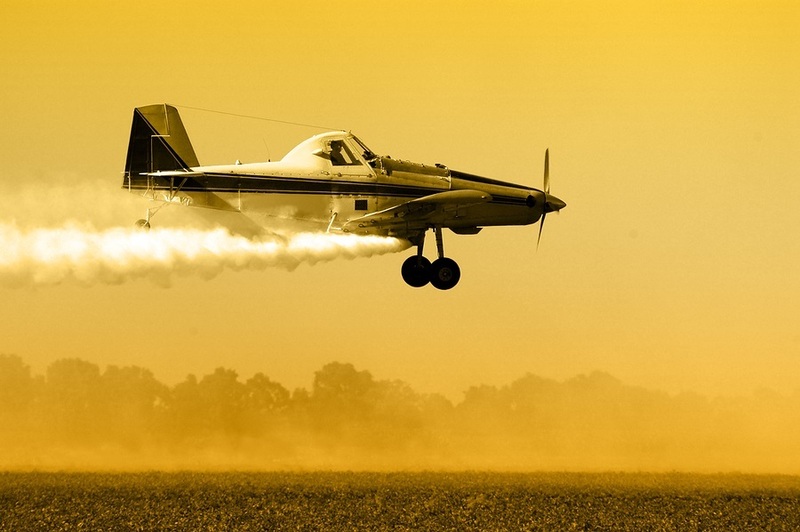 In one study, farmers exposed to organochlorine insecticides had a 90 percent increased risk of depression compared to those who didn’t use them. Exposure to fumigants increased risk of depression by 80 percent. People exposed to pesticides are also more likely to have Parkinson’s disease. Clearly, when it comes to toxins, unless the chemical is acutely toxic, the real harm occurs when your body becomes chronically overloaded with them, and most people today are exposed to thousands and perhaps tens of thousands of different chemicals on a regular basis. Farmers are not the only ones at risk for adverse effects from pesticide exposure. Glyphosate can be found in most processed foods in the Western diet courtesy of GE sugar beets, corn, and soy, and research shows glyphosate enhances the damaging effects of other chemical residues and toxins. While nearly one billion pounds of glyphosate is doused on both conventional and GE crops worldwide each year, genetically engineered (GE) crops receive the heaviest amounts. Meats from animals raised in confined animal feeding operations (CAFOs) may also contain higher amounts of glyphosate residues, as GE soy is a staple of conventional livestock feed. It’s quite crucial to understand that glyphosate contamination is systemic, meaning it is integrated into every cell of the plant, from root to tip. It’s not just an issue of topical contamination, as with many other agricultural chemicals sprayed on crops. Normally, you need to thoroughly wash your produce to remove topical pesticide residues, but you simply cannot remove glyphosate from your produce. And neither can food and animal feed manufacturers who use GE ingredients in their products. This is part and parcel of what makes GE foods so harmful to your health. Dr. Stephanie Seneff, a senior research scientist at Massachusetts Institute of Technology (MIT), has been instrumental in educating people about the hazards of glyphosate. In the video below, she explains how aluminum and glyphosate act together as synergistic poisons that promote autism. Based on the current trend, Dr. Seneff predicts that by 2025, half of all children born will be diagnosed with autism. Clearly, we must identify leading environmental factors contributing to this frightening trend. Lack of vitamin D caused by inadequate sun exposure is one factor. Nutritional deficiencies caused by poor diet are another. It seems quite clear that aluminum exposure plays a role in neurodegenerative diseases like Alzheimer’s. Other neurotoxins such as fluoride and glyphosate add to the toxic burden. The best way to protect yourself is to be careful about your choices in food and personal products, and minimize your use of vaccines and other drugs that are often contaminated with aluminum. Optimizing your dietary sulfur is also essential, as your body needs sulfur to manufacture its number one weapon against aluminum overload: glutathione. Processed foods and sodas. This will help you avoid both GE ingredients (which tend to be contaminated with glyphosate) and aluminum. In addition, replacing processed foods with whole organic foods will drastically reduce your sugar/fructose intake, which will help normalize your insulin and leptin sensitivity. This is in fact one of the best strategies for protecting and preserving your brain function and overall health. Fructose and gluten are other dietary factors that promote Alzheimer’s, and are best avoided as much as possible. Mechanically deboned chicken, which tends to be high in fluoride as a result of the processing. Dental amalgams. Dental amalgam fillings, which are 50 percent mercury by weight, are one of the major sources of heavy metal toxicity. However, you should be healthy prior to having them removed. Once you have adjusted to following the diet described in my optimized nutrition plan, you can follow the mercury detox protocol and then find a biological dentist to have your amalgams removed. Cosmetics and personal care productscontaining aluminum, such as antiperspirants (including salt crystals, made of alum), lotions, sunscreens, and shampoos. Vaccines containing either mercury (thimerosal) and/or aluminum. Anticholinergics and statin drugs. Drugs that block acetylcholine, a nervous system neurotransmitter, have been shown to increase your risk of dementia. These drugs include certain nighttime pain relievers, antihistamines, sleep aids, certain antidepressants, medications to control incontinence, and certain narcotic pain relievers. Statin drugs are particularly problematic because they suppress the synthesis of cholesterol, deplete your brain of coenzyme Q10 and neurotransmitter precursors, and prevent adequate delivery of essential fatty acids and fat-soluble antioxidants to your brain by inhibiting the production of the indispensable carrier biomolecule known as low-density lipoprotein. Fluoridated toothpaste and fluoride gel treatments. Non-stick cookware will outgas fluoride, but also avoid other aluminum-containing products, such as cans, foil, juice pouches, tins, and water bottles. Get the news right in your inbox !